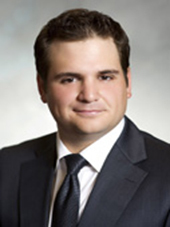 Jonathan summered, articled and worked for several years as an associate at a large Bay Street firm prior to joining Tkatch & Associates. Jonathan specializes in personal injury claims helping people who have been injured as a result of motor vehicle accidents, slip and falls and assaults. In addition he routinely acts as counsel for people who have been denied coverage by their short or long-term disability insurer. Jonathan has been before the Ontario Superior Court of Justice and the Financial Services Commission of Ontario. Jonathan is responsive to clients’ needs and is always available to answer questions or discuss his clients files with them. Jonathan is involved in a variety of charitable causes and has chaired several charitable committees and fundraising events. He is also an avid canoe tripper and directed the canoe trip program at a children’s summer camp in Northern Ontario for five years. Jonathan is also passionate about all sports, but especially hockey, golf and baseball.